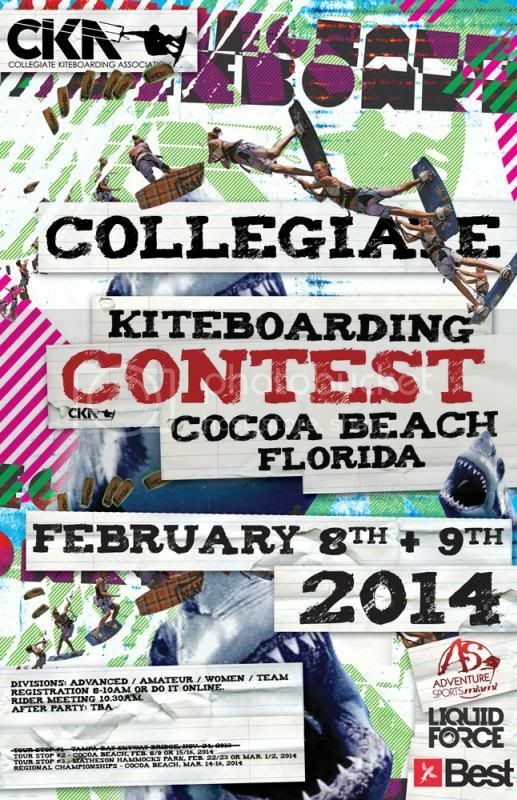 * OFFICIAL 24 HOUR NOTICE FOR CKA TOUR STOP #2 Cocoa Beach: As of Friday 2/7/14 the forecast is ON for this weekend at Cocoa Beach. Riders please show up at midday Saturday for Rider Meeting 12pm. We will run as many Divisions we can in the afternoon - Chaser Goodwin is bringing down a WINCH and there will be a Rail and Kicker - and party at Sandbar Sports Grill that night. Get in touch with Bret Sullivan or Good Breeze Kiteboarding for housing. Stay tuned for our an update tomorrow to confirm Divisions that will take place on Sunday 2/8-2/9. 2 Freestyle Divisions: For intermediate and Advanced riders! Everyone Can compete! With Race and Big Air Divisions as well! Prizes: Cash for 1st place in your division! In the event of a bad forecast for wind, the contest will be postponed until the following weekend.